When the grumpy and determined ex-sheriff of Absaroka County, Wyoming, namely Lucian Connally, coerces the current sheriff of Absaroka County, namely Walt Longmire, into investigating the suicide of a police detective in a neighboring county, you know nothing will run smoothly. Cady, Walt’s daughter, is expecting her first child in Philadelphia. It will be a difficult birth so Cady wants Walt there. With all the complications of the case, as well as his well-honed sense of justice, tethering poor Walt to Wyoming, it will be too close to predict whether Walt will make it to Philly or not. When is a suicide not a suicide? When there doesn’t seem to be a valid reason for it. Gerald Holman was working in the cold case department. It soon becomes obvious to Lucian and Walt that the case of a missing woman Holman was working on has many layers to it. Forget about the TV series, enjoyable though it is. Get the actors’ faces out of your mind. (Although you can keep Robert Taylor’s visage for Walt if you want.) Craig Johnson’s series is different. The most significant difference is in Walt’s character. TV Walt is a laconic good-old boy. Book Walt is a complex, well-educated, funny, laconic good-old boy. And let’s not get into a bean bag fight about Vic and Bear. And who the heck is Branch when he’s not smoldering on TV? Of course, “Any Other Name” is entertaining. Thank you, Craig Johnson, for giving us a reason to keep reading your series. Raise your hand if you don’t know that Robert Galbraith is a pseudonym for J. K. Rowling. Really? No hands? I liked “The Cuckoo’s Calling" without knowing Galbraith’s secret identity. It didn’t feel like a book written by a first-time author. I remember thinking what a great job Galbraith had done with his female protagonist, Robin Ellacott, a difficult feat for a male author. Well, duh. I like “The Silkworm,” with the same cast of central characters, even more, but not because the author is J. K. Rowling. I think the same reason both of her series are so readable is that Rowling really knows how to pace and balance her stories. She also gives us an old-fashioned good versus evil theme. Cormoran Strike is a private eye. He used to be a brilliant Army investigator, but an IED blew off part of one leg, and he has been returned to civilian life. For someone who was used to having his commands obeyed, his questions answered, and his metaphorical dogs let loose, civilian life is a twilight land. "The Silkworm" picks up right after the events of "The Cuckoo's Calling." Cormoran has recently broken up with his long-time girlfriend, a disturbed, high society, beautiful, high-maintenance wreck of a woman. But it’s been long enough that Charlotte has turned right around, grabbed an old flame, a dissolute wastrel who is from her stratum, unlike Cormoran, and is scheduled to marry him soon. “The Cuckoo’s Calling” began with the serendipitous addition of Robin Ellacott to Cormoran’s office. She had just moved to London to be with her po-faced fiancé and needed a job. She has secretly harbored a desire to be a private eye and Cormoran may be her entrée. Or maybe not. It’s a great pairing, although it's not Holmes and Watson. Not Poirot and Hastings. Not Wolfe and Goodwin. Cormoran is meticulous and clean, but not fussy. Robin is sincere and smart, but not servile. They often don’t talk the same language, but they eventually work around that. Cormoran is ex-Army and imposing. Robin is polite and pretty. Here is the plot, but you need to read the book for the joy of meeting Cormoran and Robin. An unsuccessful author, Owen Quine, has written what he knows will be the greatest novel ever written. “Bombyx Mori,” a pretentious use of the Latin name for a silkworm, has shaken up a small part of London’s literary world. Using thinly disguised versions of many people in the book world, "Bombyx" spills all the nasty secrets of both people who disliked Quine and people who were kind to him. Revenge may be a dish best served cold, but the passion behind it is often red-hot. Then Quine disappears. Leonora Quine, Owen’s wife, needs money. She needs Cormoran to find her husband, dead or alive. Leonora has only one reason to live: to take care of their disabled daughter, Orlando. Unfortunately, she herself creates some of the more difficult hazards Cormoran must navigate to find Owen. In the process, Cormoran meets Owen’s agent, publisher, editor, girlfriend, and assorted industry types, none of whom have any joy in their lives, all of whom may have had good reason to see that Owen stays lost forever. Robin is due to marry Matthew soon, but she has not broken the news to Cormoran. And she has not told Matthew the truth about what she hopes to accomplish working for Cormoran. This is also Robin’s coming-of-age story. Loved this book. Can’t wait for more. Some of the best-written crime fiction is contained in James Sallis’s Lew Griffin series. Sadly, that series is out of print, but we have the consolation that he continues to write new works. 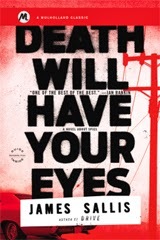 It is also gratifying that Death Will Have Your Eyes, one of his older works, is being re-issued by Mulholland Books. Death Will Have Your Eyes is purportedly about a retired spy re-entering his long-deserted field. “Dave” has been re-activated as an assassin, on the trail of a fellow assassin, someone he obviously has known quite well. Sallis doesn’t give a lot of detail; his readers must be grown-ups and search between the lines. What I think Sallis really has created is a story of Dave’s odyssey to reclaim his humanity, to reclaim his right to sit and enjoy a glass of wine with his beloved, Gabrielle, to not have to bear the burden of what he did as an assassin for many years. On the other hand, it is an act of kindness he did as an agent that has, in his words, “spiraled” to bring him to the point of life or death. While Dave tracks an assassin, others track him. And try to kill him. Only they don’t. Most step aside, as if acknowledging the greater task that lies ahead of Dave. They are layers Dave must shed before confronting the final choice. Whether Dave is successful or not in becoming human again, he has learned that old agents never die, they live on in myth. And their song is sung by Sallis. Apartheid should never have happened, and yet it did. It is Malla Nunn’s duty to remind us of its horrors through her dark and solemn books. Detective Sergeant Emmanuel Cooper and Detective Constable Samuel Shabalala live in the world of South Africa after segregation has been institutionalized. In Present Darkness, it is 1953 and Cooper and Shabalala walk a fine line with their friendship. For all intents and purposes Cooper is white and Shabalala is black, making them separate and unequal under the eyes of the law. But they are friends, brothers under the skin, and there is no doubt they would die for each other. 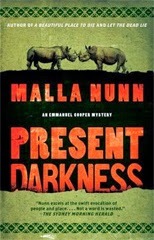 In Nunn’s fourth book in her series, Cooper and Shabalala must deal with police corruption, a preternaturally cunning police lieutenant, the beating and robbery of a liberal white couple, the arrest of Shabalala’s son for that attack, the kidnapping of a prostitute, and a basketful of lies from practically everyone they meet. Cooper is trying to find a way to live with his black common-law wife and their baby daughter without tripping over laws that would strip him of his job and toss him in prison. He must balance endangering their well-being by nosing into a criminal enterprise that involves the shantytown where Cooper grew up, shoulder to shoulder with black families. Fix and Fatty Mabela are brother and sister criminal “entrepreneurs” and Cooper’s childhood companions. Cooper has left Sophiatown but Sophiatown apparently still firmly holds a piece of him. Cooper must return there to unwind the tangle of cases in order to free Shabalala’s son. Nunn presents an exciting crime series, but her stories are richer than normal because of their historical context. Her heroes don’t just battle the criminals; they fight against legislated injustice. How wrong is it, Nunn asks, for honorable men to have to scurry in the shadows? I Am Pilgrim is the sort of book I wasn’t sure of for the first few chapters. The plot layering was so thick, I didn’t think the author ever would come up for air. Within a few chapters, the story had changed from a gruesome and brilliant murder of a young woman in a dingy walk-up in New York to a kid in Saudi Arabia rushing to his father’s very public execution. I didn’t know whether I’d like it a lot or be annoyed at the writerly shenanigans. If you read this book — and you should — this is where I tell you to keep the faith. The big-city American crime is just the current focus of an intriguing character whose background is international, covert, and deadly. In the end, I came to admire tremendously Terry Hayes’s ability to weave in and out of past events. There are three interwoven and interlinked stories. The first is the murder of that young woman in New York. The-man-with-many-names — let’s call him Scott for the sake of convenience — is helping his friend Ben, a homicide detective, solve the case. That case has a connection to Turkey, as does a prior event in Scott’s mysterious past life. The second story is of Scott’s past life as a covert agent of an ultra-secret organization and his current (that is, contemporaneous to the most recent storyline) re-call to arms. Although he “retired” from that covert life, he has been reactivated because of a worldwide terrorist threat. The terrorist threat consists of one man from Saudia Arabia. That man was the boy who witnessed his father’s execution and has been motivated to seek revenge in a devastating way. How can Scott find a man who is brilliant and has covered his tracks almost flawlessly. “Almost” is the key word. There is a slim chance derived from a tiny piece of information that may not even be related to the terrorist. That information drives Scott to Turkey. Finally, in Turkey, a billionaire has fallen off a cliff and died. It is Scott’s cover story that he is an FBI agent sent to investigate that there was no monkey business involved. Lo and behold, as he actually investigates the crime, there is some monkey business. Small wonder that this plot-driven book is 624 pages long. Hayes employs the trick of having Scott exclaim at many points that he had missed something which would come back to bite him later. In this first-person book we get the strong feeling of Scott’s future presence, that he survived his travails and is narrating this book from a distant perspective. When he writes his will — one of the best scenes in the book — we know he does so unnecessarily. Does this diminish the pathos? A little. But at the same time, there’s no assurance that future Scott is whole and healthy. The first-person narrative is my favorite but is, no doubt, tricky. To confuse the issue, in the ARC I read, Hayes also switches tenses which made me lose the timeline. This is a good summer read.